In elementary school, I left a note for Philip by a big tire swing on the playground. Twnety years later, he finally decided to write one back. To get the full story, you have to go back to Monte Sano Elementary School, which is where we first met. Philip was the "new kid" in Mrs. Stoddard's second grade, and every girl immediately had a crush on him. Perhaps it was his silky hair and grey sweatpants. Maybe it was the way he stuffed grapes in his upper lip, stretched out his ears and made monkey noises. It could've been the fact that he was such a perfectionist that he wrote his papers twice, so they would be almost black with lead (this tendency towards perfection should've been a strong indicator of the profession he ultimately pursued). Regardless, it was pretty certain that as soon as the class went out for recess, the girls would chase him all over the playground. I like to think this is how he got his start running. I was a little more aggressive and idealistically romantic than the other girls. One day, after growing tired of chasing him around and preferring a straight answer, I left him a note by the tire swing on our playground, asking him to check "yes" if he liked me and "no" if he didn't. 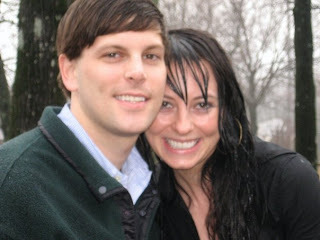 I called him up, told him there was a note at the school and waited, thinking in about an hour Philip Wiles would profess his love, the sky would crack wide with beams of light, angels would sing, and people everywhere would set off fireworks in honor of our profound playground love. I never heard back from Philip. We attended seperate highschools and the last I heard from the gossipmill, he was some sort of bigshot runner whole was wholesale against fun of any sort, especially the kind that might cause him to oversleep or make him drag during the mile. In other words, the kind of fun that every other teenager and college student was having. And the last he heard of me was that I was one of those fun-loving girls. We reacquainted ourselves a couple of years ago at the wedding of our mutual friend, John David Reed. Despite, or maybe because, of our differences, we hit it off, which brings us to a rainy Saturday in December. We were back in Huntsville for Christmas break. That morning, Philip got up and ran the Rudolph Run while I slept. When he got back, we decided to go do some Christmas shopping. As we were heading down the mountain, Mrs. Stoddard called and asked us if we could come up to the elementary school and help her move some desks. When we got to the school, no one was there so we sat in the car for a bit, listening to the rain beat down on the roof. Finally, Philip told me he wanted to look at the playground and, more specifically, something on the playground I couldn't see. He told me he was sorry, but that I was going to have to get out of the car and get wet. You've never seen a girl so eager to get her hair wet. 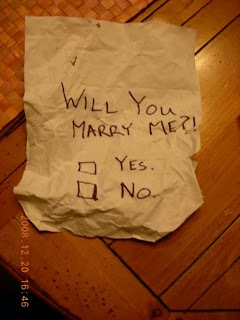 We walked down to the old tire swing and there, in a sodden white envelope, was a note much like the one I'd given him years earlier, except this one asked if I'd marry him. I was so shocked and touched and happy that I couldn't say anything for a minute. But the answer, of course, was yes. Philip whipped out a dozen roses, champagne and glasses from beneath the tire and we huddled in the doorway of the school gym together giggling and sipping champagne. It was one of the best days of my life. Even better was having Mr. Stoddard "on-call" to take photos of us. If someone told me ten years ago that all those times doodling "Mrs. Rachel Wiles" on notebooks and big chief pads second through fifth grade were not just the pointless doodlings of someone with a hopeless crush, I'd have told the person they were crazy. But now here we are, crazy in love. (Wow, that rates an 11 on the cheesiness scale for sure. I apologize for any nausea induced by that line). What a love story!! Nice job Philip! !